Nah. We're frustrated Blues players who don't HAVE the 'tude. Still havin' a time getting good pics. I found my photo lights, but can't find my light stands. looking forward to them(pics) and I WISH i could play Jazz. The only jazz I have a problem with is Progressive. Sometimes it just sounds like it's not working right. The structure is just off. by progressive...do you mean fusion, or Frisell type stuff? I mean when everyone is playing something different and all you have is a base line or basic piano rift playing over and over again, then everyone has to have their own solo and it has no relation to the main tune, type of progressive jazz. The latest issue of Guitar Player magazine has an article about a 13 year old jazz musician that has cut his first album(CD), has his own signature guitar, and amp. Started playing when he was 4, and already has graced the cover of a magazine. Interesting article. Here are a coupla pics. 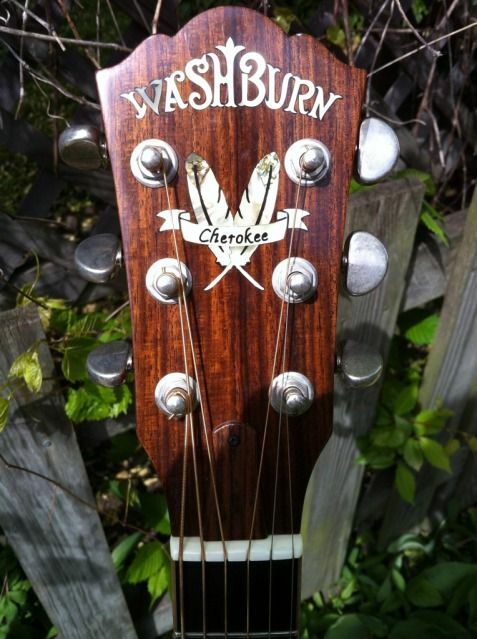 This shows the Wing headstock and fretboard inlays. This sows the pickups and bridge. Not sure if the pic shows it, but the f-holes and neck have 3-ply bindings and the top and back have 7-ply bindings. 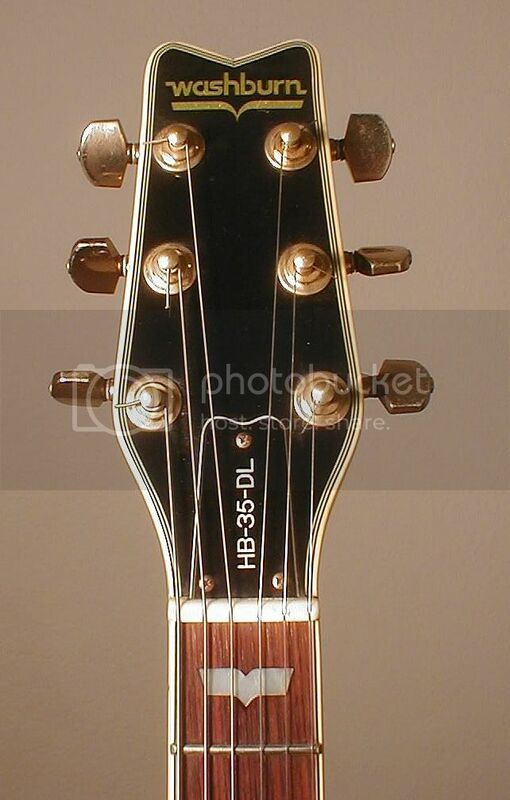 The pic above shows the 5-ply bindings on the headstock. Never did that. Back in the 70's, it was just me and a bass player. 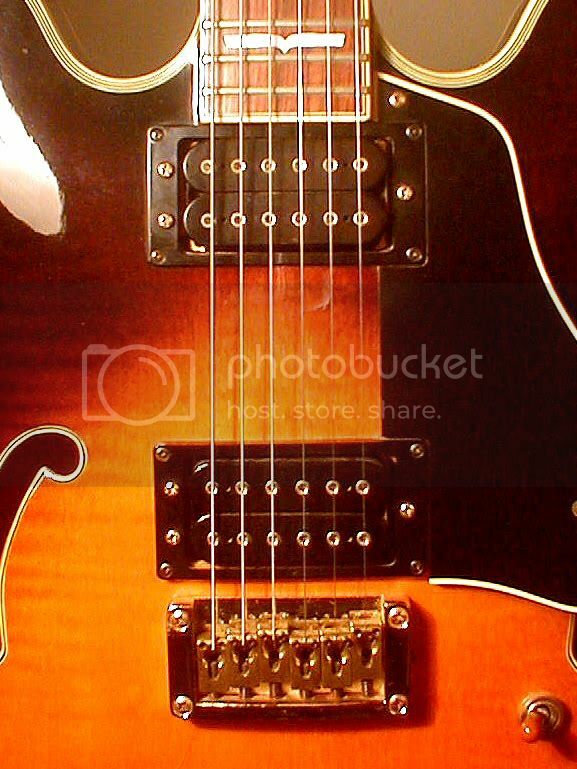 I played voice-leading chord melodies. Same with the trio I had. Later, when I played in a quartet with a piano, we were VERY careful not to step on one another's toes. When one guy was soloing, everyone else stayed right on the chart -- maybe throw in a VIm7 - IIm7 - V7 turnaround here and there, but otherwise, that's it. The soloist was expecting to have the bass on the root and five and the rhythm player playing nothing more fancy than sevenths. If the keyboard is laying on a flat-9 and I'm playing a dom 9th, it's gonna sound like hell! The idea was... it's HIS solo, so I played simple. I always got my chance and, when I did, I knew where HE was gonna be. Here's Barney doing a Blues. (http://www.youtube.com/watch?v=OZlYmWne4sk&feature=related) It's like I used to play, but I used more single-note runs. It's not the Blues. No matter how you cut it, it still comes out jazz. Here's Barney doing Misty, an old jazz standard. (http://www.youtube.com/watch?v=mjI0XyrgtCU) Notice how he lays back when the bassist solos. No one's steppin' on toes here. 2 points...love the music. I also enjoy the prog stuff from time to time, LOVE Frissel (who's stuff is literally all over the map) but find the references(Kessel Montgomery) you made really peerless. And the guitar...wow. Right down to the Amber tip. You really have a gem there. Oh, yeah... love the stuff Frisell does -- reminds me of Mikes Davis in a lot of ways. Wish I could play like that, but that's just not me. Another favorite of mine is John McLaughlin. Blew me away when he did the album of standards, but I've been a fan of his since his days with Miles. Again, wish I could, but I can't. Sorry for the delay in my reply - I am recovering from an Arterial Aneurysm I had operated on a few days ago. I had a 35 DL in white, my mom wanted to get this guitar for me at a shop near Colo. Springs around 1985. they said it was a prototype or a one off on this color. My EQ didn't work half the time, it spent so much time in the shop I traded it for a Strat Plus. I could NOT get sound out of it most of the time, it wasn't a battery, either. When I wanted them to take it back they wanted a restock fee.... but you know.....I really liked the regular HB35.